Formula developed by a Chinese man from Jiangchuan County in Yunnan Province at 1902. During the exploration of the entire region, he tasted hundreds of herbs in that region. It is very well recognized as a stop-bleeding remedy and often used in various Asian military. The exact formula is a closely guarded secret. It's one of the two Class-1 protected traditional medicine in China, which gives it a 20 years protection. Adults: Take 2 capsules, four times a day. Children between 5 and 12 years of age: Take 1 capsule, four times a day. 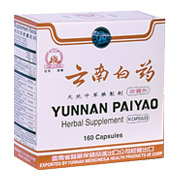 Yunnan Paiyao - is shipped in a discrete, unmarked package. Orders are processed immediately and usually take about 3 to 5 working days to be received. We do ask that you try it for 2 to 3 weeks to feel the full effects. Any information received is used only for order processing and shipping purposes. Your information, such as e-mail address, will never be disclosed to a third party.